Home Features Sufganiyah or sfinj? TEL AVIV — The sufganiyah is the plump, shining star of Chanukah in Israel. During the holiday season, the famed jelly doughnut poses in the windows of cafés and bakeries across the country. It sparkles with oil and sugar, and shows just enough filling to keep fans interested. Every year, top chefs compete to give the sufganiyah an edgy new twist,but in homes across the country, Israelis quietly fry up a humbler doughnut called the sfinj. The confection hails from North Africa and is a favorite of Jews whose families came to Israel from the region. 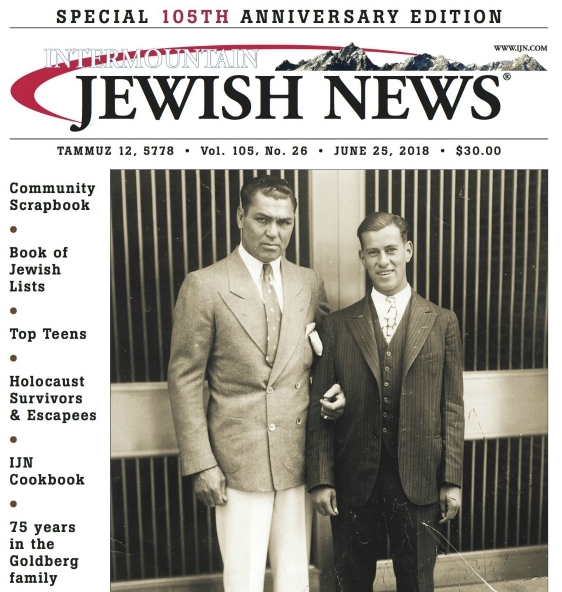 Even European Jews have adopted the sfinj and helped push it toward the limelight. Israelis of North African descent prepare sfinjim for holidays and special occasions. Dan Illouz grew up in Montreal, where his family ate the doughnuts during the eight nights of Chanukah. When he immigrated to Israel eight years ago, he was dismayed that he could only find sufganiyot, so he began making sfinjim in his kitchen to celebrate the holiday. During Chanukah in 2010, Illouz, 31, who lives and does public relations in Jerusalem, invited a handful of friends over to enjoy the doughnuts with him. Word spread quickly: Last year, about 400 people showed up at his three-bedroom apartment for what has become an annual “sfinge party” (as he spells it). Illouz was expecting at least as large a crowd for the third night of this Chanukah, Dec. 14. [dropcap]To feed the masses that show up throughout the night and spill into the street, Illouz begins preparing at around 7 a.m., 12 hours ahead of time. He estimated that he fries up about 150 of the doughnuts. It’s first come, first serve. Illouz puts on Moroccan music, and when the sun sets, he and his guests light the menorah candles. While sfinj are of course at the center of the celebration, Illouz also serves sweet couscous and store-bought Moroccan cookies and beverages. Needless to say, sufganiyot, plural for sufganiyah, are not on the menu. Illouz said his sfinj party is an expression of both Moroccan and Israeli pride, a duality that has become easier to reconcile in recent years. While Mizrahi Jews, or those with roots in North Africa and the Middle East, were long a socioeconomic underclass that faced systemic discrimination in Israel, their culture has lately experienced something of a renaissance. About half of Israelis are now of Mizrahi descent, though the numbers are becoming blurred by marriage with Asheknazi, or European Jews, and others. Mizrahi music dominates the Israeli airwaves, with some musicians even singing in Arabic. Mizrahi cuisine is not only popular street food, but is also celebrated at high-end restaurants and on popular cooking TV shows. Mizrahi celebrations, like the post-Passover Mimouna feast and the henna pre-wedding bridal shower, have been embraced by the mainstream. Mizrahi Jews have been contributing to Israeli culture for decades, whether or not it was always appreciated. Some credit them with bringing the tradition of Chanukah doughnuts to the Jews of Palestine in the first place. According to this theory, sfinjim were largely superseded by deep-fried Eastern European jelly doughnuts similar to today’s sufganiyot. The oil is a nod to the Chanukah story in which the ancient Temple’s menorah stayed lit for eight days on a one-day supply of lamp oil.) The Arabic word sfinj, meaning sponge, was replaced by sufganiyah, a Hebrew word sharing the same root. Uri Scheft, a co-owner and chef at the high-end bakery chain Lehamim, learned to make the doughnuts from his wife, whose mother immigrated to Israel from Morocco. He included a sfinj recipe in his 2016 cookbook Breaking Breads: A New World of Israeli Baking, which celebrates the cuisines produced by the “melting pot” of Israel. While it is hard to find a hot sfinj for sale in Israel, it is not impossible. Keren Kadosh, a pastry chef with a Moroccan background, occasionally serves them at her downtown Jerusalem bakery, Café Kadosh — often in response to requests. At the same time, her lifetime of eating the doughnuts has shaped the way her bakery prepares sufganiyot, which it serves at a rate of a 1,000 day during Chanukah. “When the the sufganiyot come out of the fryer, we role it in sugar, and we get that exact same crunch, sweetness and texture,” she explained.